My journey into acting started the way most things do: I had a crush on someone. This time it was the guy cutting my hair. I was 18 and his name was Bruno. He was a hairstylist by day and an acting student by night. I found myself in his salon one day and there was a Samuel French edition of a play at his station. I started reading it out loud while he trimmed my split ends. I had never been in a play before but he was impressed with how “natural” I sounded and invited me to audit his acting class at the Terry Schreiber Studios that night. I stayed in that studio for many years. (Bruno was gone in a few months.) How I went from auditing a sense memory class to starring on Broadway a few years later includes two major factors: hard work and luck. The “luck” was getting cast in a non-equity company at the Berkshire Theater Festival. I had read about the audition in Backstage, my only source for auditions at the time. That summer, I met a young director named Michael Greif. We became friends and when the summer was over and we got back to NYC, he asked me to be in a production of “Machinal” he was directing at a new theater company called Naked Angels. It was that role that director Michael Mayer remembered many years later when he cast me in the role of Lucy for the Broadway revival of “You’re A Good Man, Charlie Brown.” That show led to more shows and eventually to TV and film jobs. But even still, you never forget your first love and for me, the theater will always be it. Two years ago, I was feeling like I needed a new creative outlet. I had done more plays than I could fit on my résumé. I had gotten married and had kids. Things were good, but something was missing. Then something magical happened: a friend approached me with an opportunity to host a podcast. I had no idea how to host a podcast but I knew I loved listening to them so I said yes immediately and got to researching. I remembered that new writers are told to “write what you know,” so I decided my podcast would be me interviewing who I know. That was over 100 episodes ago. My idea for the podcast was simple. I wanted to create the show I wish I had when I first started out and I would do it by inviting my successful actor friends to share their career secrets. I would ask them how they handle adversity, prepare for auditions, learn lines, first fell in love with acting, handle long stretches of time without work, recover from being fired, career envy, typecasting, sexuality, and more. My guest list includes the incredible friends I have met during my career. Every guest opens up and shares revealing, little-known facts about their lives, their loves, their struggles, and triumphs. Each episode is designed to renew your determination and passion to follow your dreams! Do it because you love the subject matter and would be happy whether you have 10 listeners or 10,000. Upload at least three episodes when you launch. Invite friends to review/rate the podcast in iTunes. 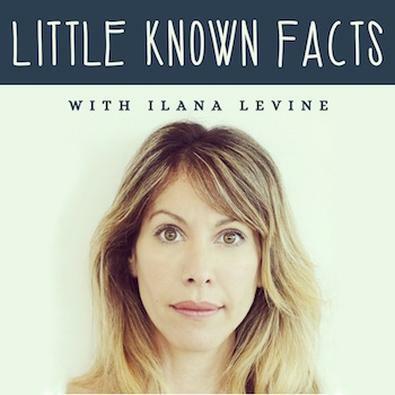 Ilana Levine is an actor and creator and host of the “Little Known Facts” podcast. Her Broadway credits include “You’re A Good Man Charlie Brown,” “Wrong Mountain,” “The Last Night Of Ballyhoo,” and “Jake’s Women.” She has appeared in many television shows and films including, “Tanner ’88,” “Seinfeld, “Law and Order,” “Damages,” “The Job,” “Confessions of a Shopaholic,” “Kissing Jessica Stein,” “Gigantic,” “Ira and Abby,” “Failure to Launch,” “The Nanny Diaries,” “Friends With Kids,” and “Five Flights Up.” You can find her on Twitter, Facebook, and Instagram.